Microsoft today has unveiled a near final version of its browser – Internet Explorer 8 RC1 for systems running Windows Vista, Windows Server 2008, Windows XP and Windows Server 2003. Smart Address Bar In addition to matching URLs in the user’s site history, the Smart Address Bar in Internet Explorer 8 has been reorganized to more efficiently match what a user types in the Address Bar with titles in the history as well as content in their favorites without duplicates, making it easier to locate sites the user wants to visit. CSS 2.1 Upon final release, Internet Explorer 8 will have full support for the CSS 2.1 specification. With support for CSS 2.1, Web developers and designers can write their pages once and have them more easily render properly across different browsers. Microsoft expects very few changes between RC1 and the final release but will include necessary adjustments as identified by the developing community. Emerging standards Internet Explorer 8 incorporates advancements for what will become the standards of tomorrow, such as W3C’s HTML 5 Draft DOM Storage standard, the Web Applications Working Group’s Selectors API and ECMAScript 3.1 endorsed syntax. Developer tools The tools formerly available via the Internet Explorer Developer Toolbar are built directly into Internet Explorer 8 with expanded functionality. These tools enable developers to quickly debug HTML, CSS and JScript in a visual environment. Developers can quickly identify and resolve issues because of the deep insight the tool provides into the DOM, and now RC1 adds a helpful menu option for choosing which application to use when viewing a Web page’s source. Enhanced Instant Search Box The enhanced Instant Search Box in Internet Explorer 8 is more helpful, making it easier for users to find content of interest and increasing the odds that search results will be relevant. As users type a search term, they can see real-time search suggestions, including images, from their chosen search provider. In addition, the enhanced Instant Search Box presents results from the user’s own Favorites and browsing history. In RC1, it now includes a quick pick menu at the bottom of the Search Suggestions, enabling users to toggle back and forth between their favorite search providers’ Search Suggestions with a simple mouse click. InPrivate InPrivate helps to protect users’ data and privacy from being retained locally on the PC they are using and by third parties that might be in a position to track their online activities. New in RC1 is the ability to use either of the features (InPrivate Blocking or InPrivate Filtering) independently. InPrivate Browsing When activated, InPrivate Browsing helps ensure that history, temporary Internet files and cookies are not recorded on a user’s PC after browsing. In RC1, toolbars and extensions are now automatically disabled when in InPrivate Browsing. In addition, users are able to automatically delete browsing history when closing the browser. InPrivate Filtering InPrivate Filtering, which was called InPrivate Blocking in Beta 2, helps protect privacy by enabling the user to block content coming from third parties that are in a position to track and aggregate their online behavior. Users are provided with notice, choice and control of which third parties to allow and which ones to block. New in RC1 is the ability to manually adjust the threshold between 3 and 30 in InPrivate Filtering settings. Compatibility View list Users of Internet Explorer 8 can choose to receive a list of major sites that are best viewed in Compatibility View. 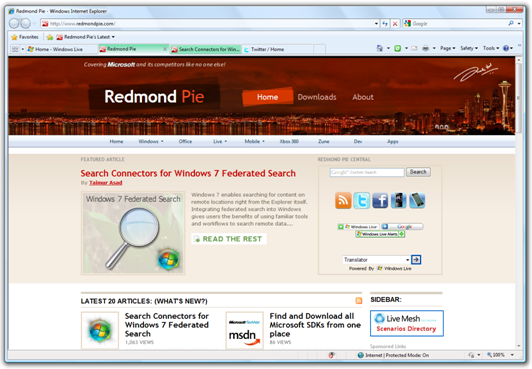 When navigating to a site on the list, Internet Explorer 8 will automatically display the site in Compatibility View without requiring the user to press the Compatibility View button. ClickJacking prevention New in Internet Explorer 8 is a feature that allows Web site content owners to put a tag in a page header that will help detect and prevent ClickJacking, a malicious exploit that tricks Web users into clicking on seemingly harmless Web pages, which can result in the compromise of confidential information, such as user names and passwords. 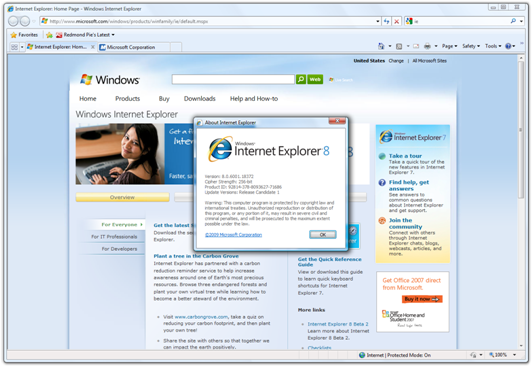 Internet Explorer 8 will detect sites that insert the tag and give users a new error screen indicating that the content host has chosen not to allow their content to be framed, while giving users the option to open the content in a new window. SmartScreen Filter Built upon the Microsoft Phishing Filter, the SmartScreen Filter helps protect against a broader set of phishing threats and helps protect from sites that attempt to download malicious software. The SmartScreen Filter is now easier to use with enhanced user interface and warning messages to reduce users’ click-through to confirmed sites. Cross-Domain Requests (XDR) Cross-domain communication is an integral part of AJAX development and mashup applications. Internet Explorer 8 includes support for XDomainRequest objects, which can be used to more securely request public resources from another domain’s server. XDR now checks Access-Control-Allow-Origin for specific URLs as well as wildcards. Cross-domain data is available only when the server signals its explicit intent to share data across domains, helping protect legacy servers from attack. We did a comprehensive review of Internet Explorer 8 Beta 2 when it was released back in August 2008. Not surprisingly, there is no major change since Beta 2. I did some testing of RC1 bits installed on 32 bit version of Windows Vista Ultimate and my own impressions are that IE 8 RC1 is indeed generally faster than Beta 2. Want to grab the new browser? You can grab it directly from Microsoft and give it a spin. 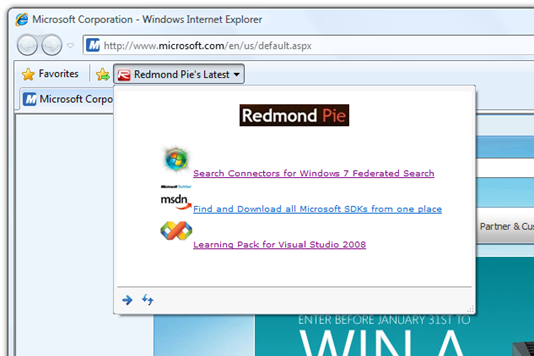 Oh and I forgot to tell you that Redmond Pie has got its own Web Slice for IE 8. Click here to subscribe to our Web Slice!